Choose from one of our many DISH Latino TV packages starting at just $29.99. Our most popular Latino TV package, DishLATINO Dos, offers the best value and most channels for your money. There are extensive bilingual TV packages to choose from, unique channel options and comprehensive international soccer coverage. DishLATINO is the leader in quality Latino satellite TV programming. 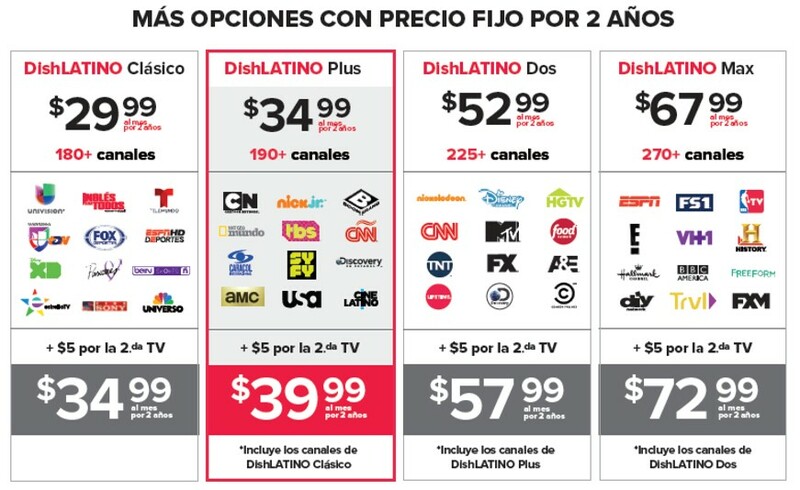 DishLATINO TV Channel Package Comparison. DishLATINO gives you access to your favorite programs in Spanish and English. Enjoy amazing TV shows, movies, and sports on channels such FOX Deportes, beIN Sports, Discovery en Espanol, NBC Universo, ESPN Deportes, and many more. Call now 1-866-579-6309 for DishLATINO packages! When you make the switch to DISH you get the best service. We have the highest satisfaction with the website and call centers. There are lower customer complaints compared to our competitors. We are available where you live and your bill has never been easier to understand. This state-of-the-art DVR also has a new user interface in Spanish. Hopper 3 also comes with integrated Netflix, Pandora, and YouTube. Watch and record up to 16 programs at a time in 4K HD resolution! This DVR is 7 times faster than the competition.